Happy birthday, Nell. Every day has been an adventure, and every day we love you more. You're the bestest baby that ever was, and we're lucky to have you in our lives. On a more pop-y note, you share a birthday with Sean Preston Federline, and your Daddy & I hope that's all you'll ever share with him. You can listen to and enjoy his mother's music, but for the love of all that's holy, stay away from his father's "music". More lessons in music appreciation will follow -- you're already a fan of Johnny Cash, Bob Dylan, Saint Etienne, The Postal Service, and Jenny Lewis, so I know you're headed in the right direction. what an amazing picture - that look, that straight through look, combined with such classically refined features. it is indeed the best photo ever. Awww, look at that. She's adorable! Thanks, everyone. It was a wonderful birthday for Miss Nell, not least beacuse of all of your warm wishes. Gorgeous child. 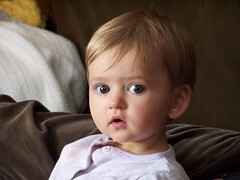 :o) I know I can't put in an order for such a beautiful child so easily, but what camera do you have??? Anon -- thank you! We have a Kodak EasyShare DX6490, purchased in mid-2005. I'm sure there's an updated version of it out there now. Happy birthday to gorgeous, brilliant Nell!